Rinse and dry raspberries. Place in food processor and puree until smooth. Pour through medium sieve over bowl to remove seeds. Keep at room temperature. Heat oven to 450°F. Bake pie crust as directed on box for One-Crust Baked Shell using 9-inch glass pie plate. To make filling, pour cold water into 1-quart saucepan and sprinkle with gelatin. Let set until gelatin softens and swells, 5 to 10 minutes. Heat gelatin over medium heat until clear and fluid, stirring as needed to dissolve, 3 to 4 minutes. Stir gelatin mixture into raspberry puree. In bowl, using electric mixer on medium-high speed, beat eggs, lavender sugar and salt until pale yellow; set aside. In large bowl, using electric mixer on medium-high speed, beat cream until thick, soft peaks form. Add egg mixture and raspberry puree, and beat until smooth. Pour filling into baked pie crust, smoothing top with rubber spatula. Refrigerate until filling is cold and firm, 4 to 6 hours. 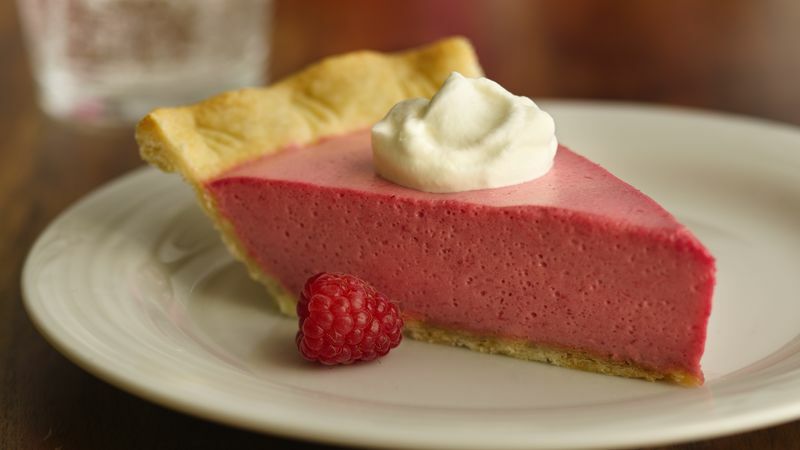 Top the pie with dollops of sweetened whipped cream and fresh raspberries. Cover and refrigerate any remaining pie. **Add 1 tablespoon chopped lavender buds to 2 cups sugar. Place in a glass jar and shake to mix. Store for 2 days. Sugar will pick up the lavender scent and flavor.